Copyright © 2018 by Dr. Dennis F. Paulaha. All rights reserved. No portion of this book may be reproduced or transmitted in any form whatsoever or by any means, electronic or mechanical, including printing or photocopy, without permission in writing from the publisher, except for short quotes in critical articles or reviews. IT BEGAN NOT SO LONG AGO on a warm spring day in a land that would become history’s shortest empire. “It” being the thing that changed everything. Maybe not everything, but pretty much everything that mattered. Spring is good, the people were thinking as they walked along the paths bordered by new flowers and thin shoots of yellow-green grass. All of a sudden, someone pointed at the sky, and everyone looked up to see what was up. What was up was a cloud. “It looks like a triangle,” someone said. At first it looked small, because it was far away. As it drifted over their heads, the people saw how large it was. “That’s a big cloud,” someone said. “It certainly is,” someone else said. Then lines started shooting out of the cloud and people started screaming and running in all directions as the lines fell to the ground. But the lines did not hit anyone. So the people stopped running and screaming. “Do you see all those lines on the ground?” the cloud thundered. “It would be pretty hard not to see them,” the people answered. Someone started to ask the cloud what kind of big trouble they would be in. The people ran home and jumped into their beds. But no one slept much that night. The next morning, people looked out their windows to see if they could see the cloud. They did not. The sky was clear. By ten o’clock in the morning, most people were outside talking with each other. The people talked and talked, hoping to convince themselves that maybe the cloud was not real. But they kept looking up at the sky. By noon, almost everyone thought the cloud must have been a dream, even though no one could explain how everyone had the same dream at the same time. By one-thirty, there was still no cloud. Some were afraid not to be there. They said they did not want to be in big trouble. Others said they wanted to find out what the cloud had to say. So while some walked back to the field where the cloud told them to be at exactly two o’clock, others went their own way. When two o’clock came, the people looked at each other and shook their heads. By ten minutes after two, the people were getting restless. “Looks like it was a dream,” someone said. “That’s what it looks like,” someone else said. “I wonder what they are?” someone said as he bent down to pick up one of the lines. “What do you think you’re doing?” the cloud said. “You’re late,” someone said to the cloud. “What do you mean, I’m late?” the cloud said. “Well, you weren’t here,” someone said. The people were a little scared again. “What business is that?” someone asked. “If you would stop asking so many questions, I will tell you,” the cloud said. “I already told you I wouldn’t,” the cloud said. “What kind of opportunity?” someone asked. “That is what I am trying to tell you,” the cloud said. “We can’t wait,” someone else said. The cloud seemed to slump a bit. “You’re right. I apologize,” the cloud said. THE PEOPLE LOOKED at the lines on the ground. “That is a good deal,” someone said. “What about the people who weren’t here at two o’clock?” someone asked the cloud. “It’s close enough,” the cloud said. “Doesn’t matter,” the cloud said. “What about the children?” someone asked. “If you do what’s right, every child will receive his or her own magical line when he or she is born,” the cloud said. “How do we know what’s right?” someone asked. “That’s your job,” the cloud said as it drifted away. “When will you be back?” someone shouted at the disappearing cloud. “But what if we mess it up?” someone yelled. And the cloud was gone. The people stared at the empty blue sky for a few minutes. Then they began walking around and picking up the magical lines. It took only a few minutes for each person to find the magical line with his or her name on it. When they were finished, the people looked around and saw there were no extra lines on the ground. Without talking, the people walked home, carrying their magical lines. But it was not easy to turn the magical lines into squares. Sometimes the sides were not all equal. Sometimes the corners were not all right angles. Sometimes the corners were not sharp. But the squares were not all the same size, because the magical lines were not all the same length. So when the squares were filled with stacks of money, some people got more than others. As time went by, some who had large squares were very proud of themselves. They liked to tell everyone how much they had accomplished on their own, without any help. Others who had large squares said they were lucky to have been given such long magical lines. Some said it was not fair that all squares were not the same size. Others said it was fine. They liked to point out that no one can say what is fair. Although no one could say exactly what is fair, many people said they knew what is not fair. One day, a small group of people came up with a plan. “That’s a great plan,” someone said. Nothing could change the fact that it was easier to end up with a larger square if you started with a longer magical line. But by having hard work increase the size of the squares, some who were given very short lines ended up with some of the largest squares. THE PEOPLE felt pretty good collecting money in their squares that grew larger the harder they worked. More than that, they liked to buy things with the money they received. The people loved cars; red ones, white ones, blue ones, and every other color imaginable. But there was a problem: There were no roads. After buying their cars and having them delivered, there were only a few things the people could do with them. They could sit in them, wash and wax them, and drive them back and forth in their yards. A few people tried to build roads, but almost no one had enough money to build a paved road longer than a small house. The longest stretched for less than a mile. And it didn’t go anywhere. Although the owner of the almost-mile-long road had fun driving back and forth on it, the thought of a road that went somewhere seemed much better. One day, while the people were talking about how great it would be to have long roads to drive on so they could go to many different places, someone came up with another plan. The people liked the plan so much they immediately picked someone to go door to door to collect a little money from each person so they could build the roads everyone said they would happily help pay for. The person chosen to collect the money carried a large bag to put the money in, because it was going to take a lot of money to build all the roads the people wanted. Everyone was excited just thinking about the wonderful roads they would soon have. But when they got together and looked in the bag, there was nothing there. The bag was empty. When they found the bagman, the bagman said he did not take their money. “There was no money in the bag,” he said. The people looked at each other, then at the floor. “I put two hundred in,” someone else said. “Look me in the eye and say that again,” the bagman said. But before anyone could say anything, a bolt of lightning crashed into a tall tree, followed by a roar of thunder. “How about you?” the bagman asked someone else who admitted to not putting any money in the bag. The people shook their heads slowly and began to walk home. JUST THEN, a tall stranger with a tall hat and a beard appeared. He told them to stop. He said if they wanted roads, they should create a government and have the government build the roads. “What can government do that we can’t do ourselves?” someone said. “Like build roads that go places,” someone said. “That’s one,” the bearded stranger said. “How would the government get the money to build roads?” someone said. “Taxes,” the tall stranger said. “Taxes? Right! Like the evil king in the Robin Hood story,” someone said. Almost everyone raised a hand. “I would if everyone else did,” someone said. “Me, too,” they all said together. After thinking about it, almost everyone liked the idea, except for a small gang whose members said they wanted to spend their own money themselves. They said they did not like the idea of government taxing people. They said they did not like the idea of government at all. They said they did not believe in the common good. They said if the choice is between paying taxes and having roads, or not paying taxes and not having roads, they would choose no taxes and no roads. “How can I have more money if government confiscates, under threat of death, some of what I have?” the gang members said. “Think about it,” the tall stranger said. “If you use taxes to pool some of your money, everyone will have far more than he or she can possibly buy on his or her own. Even those who don’t like government will become richer. It’s what a business does when it invests money to make a profit." The little gang was not convinced. The members of the gang said they wanted nothing to do with any plan that gives government the right to confiscate, on threat of imprisonment or death, any of their money. “Or in a hole,” another gang member said. “Who told you that?” the tall stranger said. "What's in the book?" someone asked. "Great wisdom," one of the gang members said. "Just listen to what the great and wonderful Ludwig von Mises wrote in his great and wonderful 1949 book, Human Action." "That is the dumbest thing I have ever heard," someone said. After listening to the complaints from the little group with big ideas, the people voted to go ahead with the tax and buy plan. And everyone was able to use the roads any time they wanted. The roads led to the creation of new businesses and jobs. Profits and wages increased. Wealth increased. And just as the bearded stranger had promised, they ended up with more money than they started with. More money than they had before paying taxes. The people were so happy with their roads that they decided to make a list of other things they could have their government buy for them with the tax and buy plan; things they could not buy themselves. Things that would make them even wealthier. It was a long list. It was also a good list. A careful list. And year after year, the tax and buy plan helped almost everyone become wealthier. The people’s squares grew larger and larger, and the people were able to do more and buy more things that made them happy. Fortunately, the people were smart enough to know they had to be careful. They knew if the tax and buy plan were used to buy foolish things, their squares would shrink instead of grow and they would have less money, not more. So they made sure they followed a rule given to them by the bearded stranger: “The government should do what needs to be done, but which the people cannot do at all, or so well, themselves.” They called it The L Rule. Someone pointed out that the bearded stranger made a mistake when he said there are things people and private businesses cannot do at all by themselves, because, as everyone knew, they could do everything by themselves. They could even build their own little roads. But it did not change the fact that there are things they could not do as well without pooling their money. So no one was surprised when the tax and buy plan, combined with The L Rule, increased the size of their squares, year after year. THE GOVERNMENT used the people’s money to define and protect property rights, which turned out to be the foundation of their prosperous and growing production and exchange economy. Business prospered and grew. Jobs were created. Wages, incomes, and profits increased. The people’s squares grew larger. Everyone ended up with more than they had before paying taxes. And the members of the count-me-out gang were furious. They said the great and wonderful Mises and all his disciples were against taxes and government, even if the government tax-and-buy plan gave them higher after-tax incomes, profits, and wealth. The people thought the gang members didn’t understand. The people could not believe anyone would prefer to be a stupid follower of dumb ideas than to have government increase their freedom and wealth. The people were wrong. The members of the count-me-out gang understood exactly what they were doing. They loved the ideas they had read about. They loved the ideas more than they loved their own children. The government used some of the people’s money to provide courts that protected the rights and profits of individuals and businesses and to bring lawbreakers to justice. It used some to make laws to protect the rights of individuals and to allow businesses to profit from the stories and songs people wrote. It used some to provide regulations to manage or prevent excessive speculation and gambling in financial markets to avoid or limit the massive losses that create recessions and depressions, and to protect people and businesses from fraudulent practices so businesses could expand. It used some to provide regulations to protect the natural environment no one owned, including fish in lakes and streams, so people could be happy and businesses could earn great profits. It used some to buy sidewalks so people could safely walk to many places and easily go to businesses and spend money. It used some to buy water systems so people and businesses would have safe water to drink and inexpensive water to use to produce things and earn greater profits. It used some to buy airports for personal and business travel and to increase business profits. It used some to buy city parks, county parks, and national parks for everyone to enjoy and to increase business profits. It used some to buy public schools and public universities so everyone could be educated and businesses could earn greater profits by having customers with more money to spend and by having the opportunity to employ educated workers, which reduced their costs of production. It used some to buy sewer systems to protect the land, the water, and the people, and to increase business profits by reducing the cost of production. It used some to provide laws to protect new inventions so great things could be produced and businesses could earn large profits. It used some to provide laws to protect buyers and sellers from bullies so everyone could have an opportunity to make and sell things, and businesses could earn great profits. It used some to pay for agencies that were responsible for ensuring food and medicines were safe, so food and drug companies could become large, and businesses could earn great profits. It used some to create laws to protect the quality of the environment and natural resources so the people could have safe air to breath and businesses would have lower costs of production and their customers would have more money to spend. It used some to pay for police departments to protect people and businesses. It used some to pay for fire departments to protect the property of individuals and businesses. It used some to provide benefits to those who lost their jobs, not only to help those who might need help, but to protect businesses, business profits, and the economy from reductions in consumer spending, because consumer spending is the driving force behind profits and job creation in a free production and exchange economy. It used some to provide benefits to those who did not have jobs, not only to help those who might need help, but to put money into the economy to increase business profits and stabilize the economy, because consumer spending is the driving force behind profits and job creation in a free production and exchange economy. Every time the people’s government wisely pooled some of the people’s money to buy things people and businesses could not buy themselves, good things happened. Business prospered and grew. Jobs were created. Wages, incomes, and profits increased. The larger the people’s squares became, and the more money people and businesses had after paying taxes, the madder the deadbeats became. They were furious that the tax and buy plan was increasing people’s wealth and freedom. They insisted, again and again, that people can spend their own money better than government can. They said anyone who did not want to pay taxes should not be forced to do so. They said, over and over again, paying taxes was like throwing money down a hole. Even though it was pointed out that every single penny government spent to buy things for people and businesses went to people and businesses, that none of it was thrown down a hole, the deadbeats kept repeating, over and over again, that the best thing government can do is get out of the way. And so, while everyone became wealthier and wealthier because of hard work supported by the tax-and-buy plan that gave everyone the opportunity to earn the greatest possible incomes and profits and to accumulate great wealth, the deadbeats complained louder and louder that government cannot create wealth, even though the facts proved otherwise. But it wasn’t about facts. Or knowledge. It was about wanting to stop government from increasing people’s wealth and freedom. Even though the deadbeats did not pay taxes, they could not be stopped from using the things bought by those who did. And the wealthier the deadbeats became by using all the things bought for them by those who did pay taxes, the louder they complained about the evil tax-and-buy plan, about how they can spend their own money better than government can, and about how government cannot create wealth. “So we don’t have to,” another gang member added. “When did you talk with the cloud?” someone asked. The deadbeats looked at each other. “Yesterday,” one said. “That’s it. Yesterday,” a gang member said. “At my house,” a gang member said. “Right,” another gang member said. “We were all there,” the deadbeats said in unison. “And the cloud,” one gang member added. “Because!” the deadbeats said in unison. No one believed the deadbeats had talked with the cloud, but they agreed the members of the gang should be allowed to say they did, because one of the things the people decided to have their government provide to everyone was the right to free speech. The people decided that even if the deadbeats did not want government to increase wealth and freedom, they did; and they would do what they knew was right. The people knew it was right to have government protect individual freedom and individual rights. And for as long as the people did what they knew was right, each and every child received a magical line when he or she was born. As it was in the beginning, however, the magical lines were not all the same length. But because the people worked hard and did what was right, the people’s squares grew larger and larger. The people paid taxes. Government used the taxes to buy things for the people the people could not buy for themselves. And the income of each person was higher than it was before paying taxes. It was truly the greatest and wealthiest empire in all the world. But it did not last forever. Not even for very long. THE PEOPLE were so happy with what they had done they decided to write their plans down so they could last far into the future. (2 “We hold these truths to be self-evident, that all men are created equal, that they are endowed by their Creator with certain unalienable Rights, that among these are Life, Liberty and the pursuit of Happiness.” The Declaration of Independence, 1776. Almost everyone liked the Declaration and the List of Laws. Almost everyone liked that idea too. Luckily, most were smart enough to know that the only way for people to “have the right to live life as they please, as long as they don't hurt anyone else in the process,” is if that right is protected by government. “It is one of the most important things government can do for us that we cannot do well enough for ourselves,” they said. They were also smart enough to know that the more money you had, the more things you could do while living life the way you wanted. And for the first time ever, in all of history, there was a nation of laws and a government of, by, and for the people. Meanwhile, the deadbeats, although they said they liked the thought of everyone living life the way they wanted, spent a lot of time and money they got from somewhere trying to force everyone to live life the way they thought it should be lived. The deadbeats also said it should be okay to hurt others as long as you do so while you are doing things you think are important, or things you like, or if you do not like someone else. Eventually, because they could not convince others to accept their anti-wealth, anti-freedom ideas, the deadbeats started a political party to elect people who would pass laws and use government to force everyone to live life the way the big-idea guys wanted it to be lived. They called it the Dinner Party. The Dinner Party promised to prophetize everything, which they said the idea guys said meant turning everything government was doing over to private corporations that would support the Dinner Party with large sums of money. They said the idea guys said it was the logical extension of another favorite chant: All government bad, no government good. The Dinner Party ran many ads making many promises to voters, telling them what a good idea it would be to eliminate all taxes. The little gang whooped and hollered. The little gang whooped and hollered even louder. The little gang whooped and hollered louder yet. For many years, most people laughed at the Dinner Party and the Let’s Eliminate All Taxes idea. Some pointed out that at the end of the Billy Goat story, the father goat saved his family by knocking the troll off the bridge. The response from the Dinner Party was that such descriptions of the actions of the father goat were proof it is necessary to rewrite the books, proof it is necessary to have restrictions on what is taught, proof that anyone who does not accept the Dinner Party version of the troll story should not be allowed to vote or even remain in the country. As the years passed, fewer and fewer people remembered the reason they were free and wealthy was because of government and the tax and buy plan. As a result, the Dinner Party eventually got some of its candidates elected. As soon as the Dinner Party candidates took office, they did everything they could to make government and politics as despicable as possible, the plan being that decent people would decide not to vote, because decent people would not want to be part of something so ugly, mean, and disgusting. The Dinner Party continued to round up voters who could be convinced to fight to the death to support the idea that there are things more important than freedom, money, and wealth; things such as telling others how to live, how to think, and how to worship. They didn’t need too many, because their despicable talk and actions succeeded in keeping large numbers of decent people from voting. For a while, some people called the Dinner Party the Soap Opera Party (the SOPs), because of its members’ insatiable interest in watching and controlling the lives of others (even if those lives were fictional), coupled with a lack of concern for their own financial well being. Others simply dismissed the Dinner Party, believing voters were too smart to vote for candidates who promised nothing but destruction. With each election, however, two things became perfectly clear. Money trumps truth and facts (and the Dinner Party had more and more money to spend). Dinner Party voters were dumber than anyone could have imagined. Some said they should find out where all the money the Dinner Party was spending was coming from. The Dinner Party told them it was none of their business. Eventually, Dinner Party candidates won enough elections to put their ideas into action. They began by messing around with taxes; first cutting taxes paid by the very rich, and then, because of the deficit the tax cuts created, eliminating government programs. It was a simple plan: Cut taxes to help the very rich and to create a deficit. Then, because of the deficit, coupled with the dogma of fiscal responsibility, claim government has to be reduced. Eventually, the Let’s EAT dogma became law. At first, many people thought they were richer, partly because they were not giving any money to government for the tax-and-buy plan, and partly because the Dinner Party told them the money the trolls took was money they were finally getting to spend the way they wanted to spend it. For a while, the people told themselves they didn’t care about the things government had bought for them that they no longer had, such as being able to trust what was in a can of soup in a grocery store, or having water from the tap they knew was safe to drink, or having property rights. Then it turned bad. Very bad. IT TURNED OUT, the real plan was not about small government at all. The real plan had a bigger goal. Destroy the middle class. Then those below. Then those at the top. Rounding up simpleminded people who liked the idea of cutting taxes in order to create deficits in order to force cuts in government was just the cover. Step one was to destroy the middle class by getting some lower middle-class people, some middle-class people, and some very rich people to come together to vote for Dinner Party candidates who promised to destroy the middle class by destroying education, facts, knowledge, and the safety, security, freedom, and financial well being of each individual. It was the most difficult step, because the middle class was large, financially secure, and educated. They were the people who were not so easy to fool. Which is why the plan began by recruiting the support of those who hated the middle class, those in the middle class who could be fooled all the time, and the very rich who could be fooled some of the time. It was a rounding up of people willing to vote against their own financial interests and their own freedom because of fear, because they were told they are victims of middle-class intellectuals, and because they were always looking for simple solutions to complicated problems. It was a collection of those who can be fooled all the time and those who can be fooled some of the time. And it worked because the idea guys knew it was not necessary to fool all the people all the time. The second step was to crush the people who can be fooled all the time; the ones the Dinner Party had conned into supporting policies that would destroy the middle class. The people who can be fooled all the time had a lot of guns, partly, they said, for self defense, partly, they said, to protect themselves from a takeover by a tyrannical government. So the Dinner Party promised to support and work for the deregulation of all guns and the unrestricted ownership of all guns as a way to get the people who can be fooled all the time, and who loved their guns more than money and more than their own children, to vote for Dinner Party candidates. The idea guys weren’t worried about the guns, because when the time came, they would simply take all the guns away. Those who would refuse to hand over their guns or who were dumb enough to take their guns into the streets to confront the Dinner Party’s tanks would simply be killed as traitors. The third step was to wipe out the very rich, who, along with the people who can be fooled all of the time, had been fooled into helping destroy the middle class and crush the poor, thinking they would come out on top. Step one was easier than expected. It was child’s play to convince people who can be fooled all the time into believing the gun con and the freedom con and to believe they are victims of middle class intellectuals. It was also child’s play to convince some of the very rich, the people who can be fooled some of the time, into believing in the short sighted and absurd idea that they can make big profits without government and customers. It was called the Freedom and Profits plan. Or, as they liked to say in private, F&P for short, but not for long. Destroying education was at the top of the plan, because public education, from elementary school through college, had created a population that believed in facts, knowledge, and reason, which was the Achilles heel of the Dinner Party. Third was to overturn all government policies and programs that increased and protected the education, security, incomes, profits, wealth, and power of the middle class. The programs helped not only middle class people, they added to the profits of businesses that sold goods and services to middle class people, and to the profits of businesses that sold goods and services to the very rich, because the very rich benefited from the increased spending power of consumers, as well as from the reductions in the costs of production that came from a better economic infrastructure, including public education that gave them better educated and more productive workers. And because such programs led to massive increases in incomes and profits and government tax revenue, the programs made it easier for government to add even more to the incomes, profits, wealth, safety, and security of the middle class, which is why they were a special target for the Dinner Party. Year after year, the Dinner Party cut away, chunk by chunk, anything that helped or supported the middle class, then the freedumb people (the spelling the idea guys used when they wrote about those who were dumb enough to believe they could have freedom without government protection and money), and then the prophit people (the spelling they used when they wrote about the very rich who were stupid enough to believe they could earn great profits without government and customers). It was death by a thousand cuts, except it did not take a thousand cuts. It was much easier than that. Instead of following the Big Brother model from the novel, 1984, knowing it is difficult and costly to brainwash educated people, it was easier to simply round up as many stupid people as possible. It was also better. It was better, because stupid people always believed anything the idea guys told them. They knew they couldn’t make everyone dumb enough. They also knew it wasn’t necessary, because they only had to fool some of the people all of the time and all of the people some of the time. Given that government helps create wealth and freedom for the middle class, and for the rich and the poor, the idea guys focused first on the people who could be fooled all of the time, to fool them into believing the opposite. To fool them into believing government takes away freedom and destroys wealth. It was easy to do, as long as it made no sense. 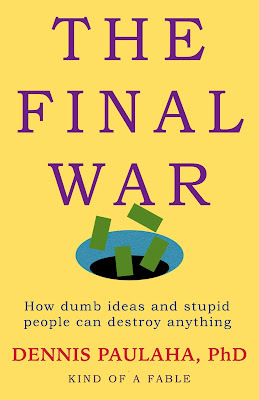 The idea guys knew they could not have the count-me-out gang or Dinner Party politicians make rational arguments, because there are no rational arguments or facts to support any of the ideas they planned on using to destroy government in order to destroy the middle class, then the poor, then the wealthy, then the country. They knew if they tried to use rational arguments, the plan would self destruct. They knew they had to keep it irrational. They knew they could do that if they first destroyed the belief in knowledge, logic, facts, science, education, and a free press. Which is why the plan was to never stop attacking facts and knowledge. It was like being the first to speak in a debate. If you're smart, you use your position to destroy what you know your opponent will say before he or she can say it. Then your opponent is left with nothing. They knew if they destroyed the belief in rational thinking, facts, and knowledge, no one could ever use logic or facts or knowledge to refute what they said. Therefore, the more irrational, the better. They first used the ideas-are-better-than-facts dogma to split the country into a small number of very wealthy people and a growing number of lower to lower middle-class people. Then they split business. Businesses, whether they were production or retail, that sold to the very wealthy were split off from those that sold to middle-class, lower middle-class, and poor people. And as the middle class shrunk, so did the companies that sold to middle class customers. They knew the plan could have led to a business war, with corporations making millions or billions from middle class customers fighting against Dinner Party policies that hurt their customers and their profits while helping businesses that made their profits from the top one percent and businesses whose customers were the growing number of poorer people. The plan used financial crashes and recessions to destroy businesses with middle class customers; to wipe them out before they could join the fight. They used false market ideas to claim financial crashes and recessions can not be avoided with regulations. It was how they put companies with middle class customers out of business and made sure there was no possibility of a fair fight among businesses. Of course, they knew such a fight could never be fair anyway. They used false market ideas to get rid of regulations on financial firms, which, although it was what financial firms thought they wanted, eventually led to the destruction of the financial industry. They played on the financial industry’s belief that regulations hurt their profits, while knowing that without regulations, the industry could not survive. There were a few battles in the political-economics business war. But the war had already been won. The Dinner Party already owned the country, because the idea guys had been able to round up large numbers of single-issue voters to support the top one percent while attacking the middle class, and because it had been so easy to make single-issue voters feel good about sacrificing their own lives and the lives of their own children so the very wealthy could become even richer. They reduced government funding for public radio and public television, which let corporate sponsors control programming. They engineered a recession that hurt the middle class. They abolished the military draft and instituted what they called a volunteer army in order to prevent anti-war protests. Of course, it wasn't really volunteering; it was joining for pay. They passed legislation at both state and national levels that destroyed public education, unions, social security, and government health programs for the middle class and the poor, and they attacked all attempts at regulating climate change. Climate change was a huge part of the plan, for two reasons. One was that the financial backers of the Dinner Party made a lot of money in industries that caused climate change. The other was that the economic damages from climate change would wipe out the middle class, make the poor poorer, and then destroy the very rich. When it was over, after the middle class was destroyed, the poor made poorer, and the very rich crushed, the people looked back and realized that each and every Dinner Party argument, promise, and action could have been explained by asking one simple question: Does it help or hurt the economy? In each case, the answer was clear. The purpose of each and every Dinner Party action had been to hurt economic growth and destroy the economy. The destruction was not an unintended or unexpected side effect of the All government bad; no government good chant. It was the intended effect. It was the plan. IT DID NOT TAKE LONG before the bought-and-paid-for legislators had nothing to do, because they had no tax money to spend and no way to enforce laws they might make, or for the corporations that bought them to stop paying them, because legislators with no taxpayer money to hand out served no profitable purpose for corporations. Or for the people. But that part didn’t matter, because the government no longer had anything to do with the people. Eventually, the legislators went home and did other things. When it was time for the next election, there was no opposition when the Dinner Party put a corporation on the ballot as its presidential candidate. Some asked how a corporation could be president. The answer from the Dinner Party was that it was time to run the government like a business. Some argued that a corporation could not legally be president, but the Dinner Party pointed out that their Supremes had already declared corporations were individuals. Only a few people voted, and the corporation received all the votes. Then, to fulfill a promise made during the single-candidate election, the corporation wrote a new List of Laws. The corporation said nothing more was needed. The corporation said it was now time to make good on its campaign promise to put the finishing touches on the big idea. The elimination of all regulations on financial businesses had been easy, and it quickly led to massive speculation and losses that caused countless bankruptcies and dragged the nation into a terrible recession. And because no one could trust anything offered for sale by unregulated businesses, even people who still had a little money stopped buying. Profits disappeared and more businesses went out of business. As more businesses went out of business, more people lost their jobs. As more customers disappeared, more businesses went out of business. There was the closing of all police and fire departments, the abandonment of courts (because courts had no purpose if laws could not be enforced), and the end of copyright and patent protection for the products people and companies created and made. More businesses went out of business. There was no longer any tax-money to give to corporations. No defense budget. No defense spending. Nothing but the purity of a system where everyone was free to spend every single penny of his or her money exactly the way he or she wanted; where anyone could copy and sell any document or product written or created by someone else; where no contracts could be enforced; and where property rights did not exist. And all the wealth that had been accumulated over the years evaporated. A few trolls had been able to get people to pay for a few things government had bought for them in the past. But not for long. As business after business went out of business, the trolls gave up as well. There were a few scattered uprisings. And a few complaints whenever the corporation’s Guardians of Freedom Militia had no choice but to kill complainers to protect the freedom and liberty of the people. In order to quiet complaints, the corporation instructed its Supremes to hand down another free speech ruling. The Supremes had already, as instructed, declared that money is speech. So it was no huge leap for the Great Court to declare bullets are also speech and that their use is protected under the free speech doctrine they had already rewritten many times. It was simple: What could be a better expression of someones views and beliefs than bullets? The middle class was gone. The poor (which was now pretty much everyone) were even poorer. The very rich were destroyed. And the land that had once been the most envied in the world sunk into darkness. After gorging themselves on the tax-free feast served up by the Dinner Party, the people and the trolls watched in disbelief as incomes, profits, and all wealth were transferred to the corporation. Their squares, which had once been large enough to hold enormous wealth, shrunk with each passing day, until they were barely visible, and then gone. A few years later, the corporation shut its doors as well. “Who can save us?” the people wondered as they wandered around in the wilderness. But the trolls were gone and there were no more private businesses, because private businesses could not exist without government. “Only government can save us,” the people said. But there was no government. “It’s all the Dinner Party’s fault,” someone said. “That’s right,” someone else said. “What’s up?” a loud voice said. The people looked around to see who was talking. “You told us you were never coming back,”someone said. “It’s not our fault our country was destroyed,” someone said. “What did they do?” the cloud said. “It was the Dinner Party’s idea to first get rid of all taxes on the very rich and to then get rid of the entire tax-and-buy plan,” someone said. “We were here,” someone said. “How did that go?” the cloud asked. “That’s what it looks like,” the cloud said. “And you believed them?” the cloud said. “How does that make sense?” the cloud said. “Because they are the job creators,” someone said. “No, they’re not,” the cloud said. “You were, until they took your money away,” the cloud said. “It looks like being rich and powerful does not mean you are also smart,” someone said. The people looked at each other and thought about how little remained of their once great nation. They also thought about how the nation that had been their longstanding enemy was now the only wealthy and powerful nation left. “Can you give us another chance?” someone asked the cloud. “But we messed up,” someone said. While the people were thinking of what to say next, the cloud drifted away. And the nation that had once been the most envied in the world sunk deeper and deeper into poverty and darkness. On a cold and rainy day at the beginning of another long, dark winter, a heavy, gray sky parted for just an instant, and a beam of golden sunlight burst through. Then the clouds closed again. And from that day on, no child born in the soon to be forgotten land ever again received a magical line. From that day on, the land that had for a short time been history’s greatest empire lived on in dark, dismal poverty. From that day on, no child born in the forgotten land knew what had existed, why it had existed, and what had been lost, because Dinner Party schools did not teach real history or facts. Dinner Party schools taught students that facts are evil and ideas are good. Not all ideas. Only the idea guys’ ideas, the ideas the children would never know had destroyed all the wealth and freedom that could have been theirs. In almost no time at all, no one who lived outside the nation that had been history’s shortest empire even remembered it had existed. Someone said it all seemed like a fairy tale gone bad. Instead of spinning straw into gold, they had spun gold into straw. Dennis F. Paulaha earned B.S. and M.A. degrees in economics from the University of Minnesota and a Ph.D. in economics from the University of Washington. As a college and university professor, he has taught macroeconomic and microeconomic theory at the principles, intermediate, advanced, and graduate level, monetary theory and policy, environmental economics, and special issues courses.